We just couldn't get through the week without another hack, could we? News broke via AllThingsD that LivingSocial was attacked, impacting 50 million customers around the world save for a few countries. The day-of-the-deal site's "by the numbers" page says it serves more than 70 million members worldwide. Information accessed includes names, email addresses, date of birth for some and encrypted passwords. No credit card nor merchant financial or banking information was affected or accessed, according to a company FAQ on the matter. 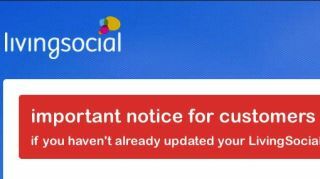 A banner on the site asks customers who haven't updated their passwords do so now, so we suggest if you're a LivingSocial junkie, you might want to think up something quick. After you've reset your password, you can ease away the stress with these hassle-free blips. Virgin America playing matchmaker with in-flight flirting?